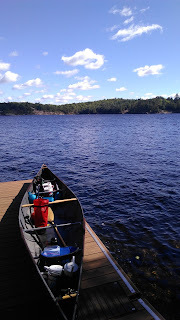 We needed a place to do a dry run before the Muskoka River X - something that would mix up some long lake paddling and some portaging. What better place than the Kawartha Highlands? 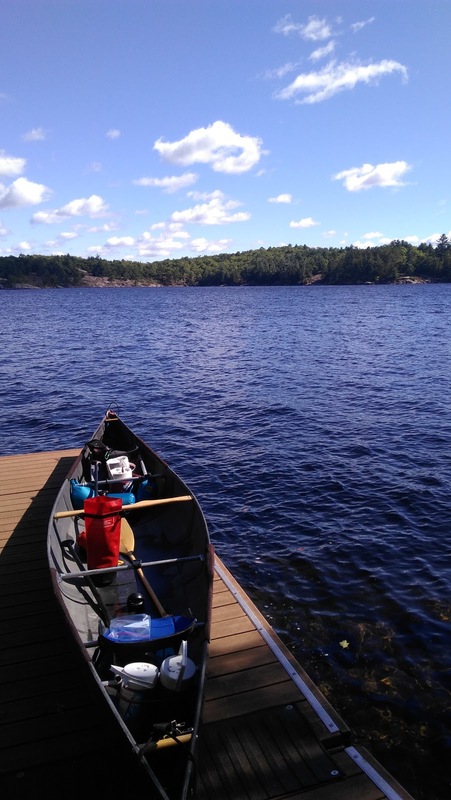 Canoe, portage to very private quiet lakes, then camp... that's the idea at this park. Note that there is a very good map available for purchase... it's $8 and has a lot more detail than the one on the web site, as well as other portages and routes!!! We were going to do it all, except the camping. Who wants to sleep with bugs, when you can just pass through? We parked the car at the far Northeast end of Wolf Lake, at the parking lot there. Another option would have been Anstruther Lake, but that sounded too easy. Wolf Lake is pretty well inhabited by cottagers, so it's not exactly an escape from everything - but still very pretty. Rock, trees, water. After paddling the length of Wolf Lake, we hit a portage over Anstruther. This was where near calamity #1 took place - we each have these shoulder straps we snatched off of luggage to really help shoulder the canoe, a trick we learned from a canoe guy. Fortunately no damage (that we could see)... so whew! All in all the portage was pretty rough, lots of rock and very hilly. This was pretty much par for the course the rest of the day. We started in a tiny little channel, into a headwind... but it wasn't too bad until we got out of that little channel and into the big lake. Yikes. The wind was strong, but the waves really were serious business... rocked and rolled, trying to keep at good angles, but it was really sketchy at times. Finally we rounded the corner toward the far north end of the lake, and things calmed down. 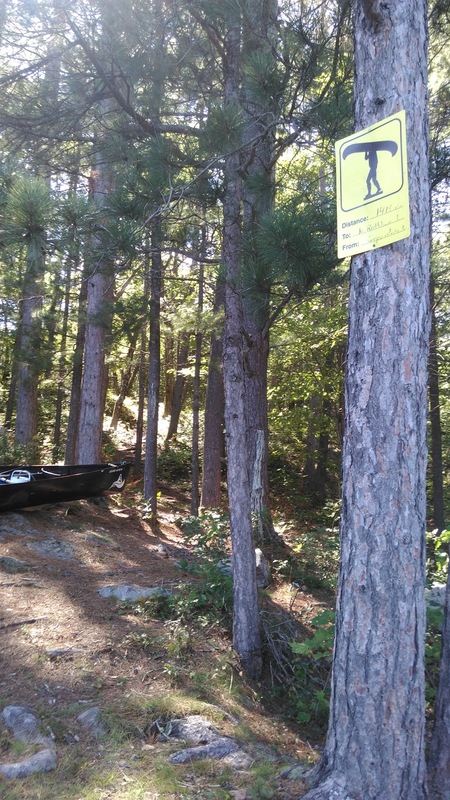 This portage was right uphill... rocky. I'm pretty sure this is where my shoulder belt gave out... my buddy's was plastic so I was all smug with my metal ones, but it didn't matter - it still cracked. GRRR! I tied it, the strap being stronger than the clasps, but this time we did get a little damage on the boat. Nothing a little epoxy can't fix, though. Interesting point - at the top there was this boat graveyard. I don't know the story, only that there are about 20 abandoned (presumably?) boats at the top of the portage. Whew, we'd made it to a nice small lake, the waves couldn't possibly bother us now! Ummmmm wrong! They were so strong, and coming left to right across where we needed to be. Really sketchy!!! 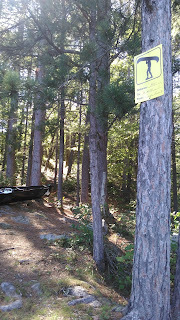 Fortunately we didn't have far to go, and soon found ourselves at the portage heading east-northeast. It probably had a name, but no idea what it was. Another hilly rocky portage. This time made a little more interesting as there were several other paddlers emerging from their weekend camping trips going the other way. This was a short little weedy channel between Copper Lake and Rathbun. On the map it looked straight, but in reality the weeds and clumps of dirt made it so you had to go back and forth, snaking through. On the bright side, it was plenty deep for paddling, so no issues. Emerging onto Copper Lake was like a dream. I've never had a lake like that to myself - but we did. A fairly sizeable lake, with no cottages, a handful of (now empty) campsites, it was just beautiful. This would be a very wonderful place to camp, once you got there with all your stuff! Which is no mean feat... we were traveling lean and mean, and it was still a pretty good slog to this point. This one wasn't listed on the map - it was really just a quick out and in to get around a small waterfall. It was tiny, and a river. Easily paddle-able. WASPS!!! I could see them just above the ground... and it's exactly where we'd have landed our canoe if not for those kids. Whew! I'm not sure if Cooper or Serpentine was my favourite, but they were both just glorious. Scenery, the peace and quiet, amazing. Someday I'd like to come back here, check out Andersen Lake and Rock Lake as well. Whoooooey this was a slog! We stopped at the sign and found ourselves looking straight up ... the trail was the steepest of the day, and the longest! Fortunately that didn't last, after the first hill it was more rolling and reasonable, and ultimately downhill to the lake. Along the way we met a group of people who had hiked up for a picnic, without boats. I believe that's called "cheating"! 160m? Is that all you've got? Downhill mostly, still rocky, not bad. This time the waves had subsided dramatically, so easy peasy. We barely looked at the map thinking we knew the way since we'd been there, then almost landed at a cottager's dock thinking it was the boat graveyard! Whoops. 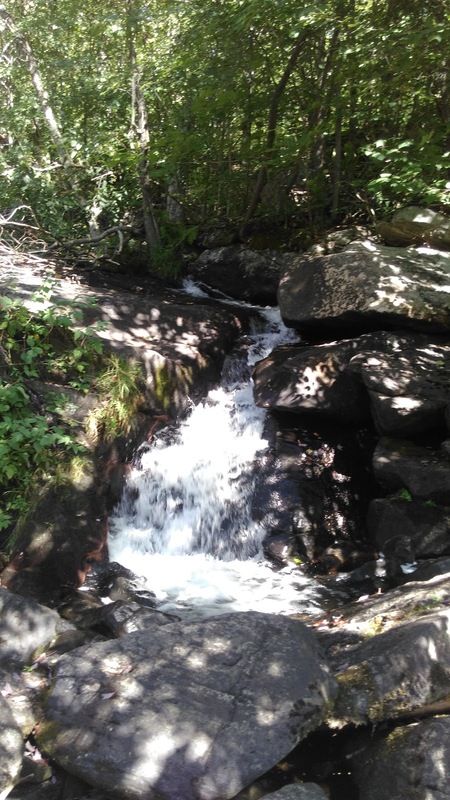 This time we did a small detour to check out the pretty waterfall we could hear. Very pretty. Very. Pretty. We caught up to the teens who had warned us about the wasps and thanked them... they were coming back the other way, through the shorter portages we'd already done. After that we found more wind and waves, but nothing compared to the previous crossing. Found the little channel back to the Wolf Lake portage. Just short of 36km total, paddling and portaging. We weren't exactly killing it out there, mostly just trying to figure our way around the whole portaging thing, and enjoying the surroundings. Here's the Garmin Activity Link. A shoulder strap for portaging is awesome, but make sure the clips will hold! Next up... MUSKOKA RIVER X! Sprint distance .. only 80km and about 10-12 hours. Paddling, portaging. Should be a hoot! Preview forthcoming.